Liu, H. and Cocea, M. Granular Computing Based Machine Learning: A Big Data Processing Approach. Studies in Big Data, Springer, in press. 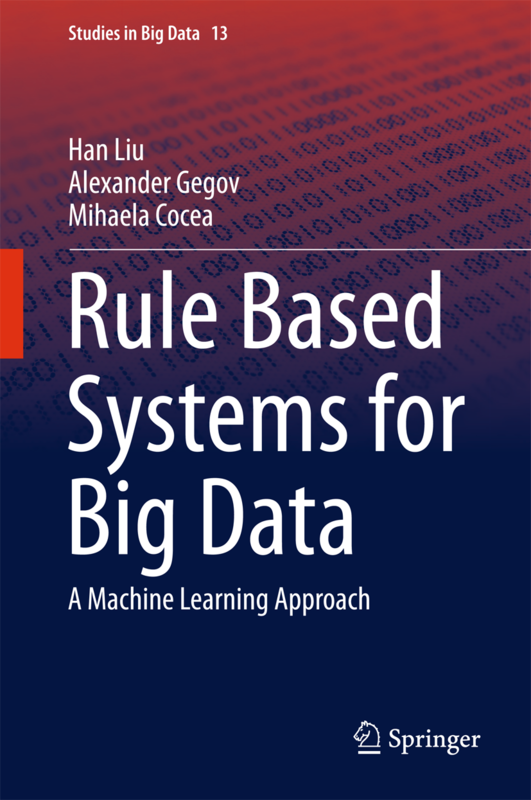 Liu, H., Gegov A. and Cocea, M. Rule Based Systems for Big Data: A Machine Learning Approach. Studies in Big Data, vol. 13, Springer, 2016. Gaber, M., Cocea, M., Wiratunga, N. and Goker, A. (eds.) 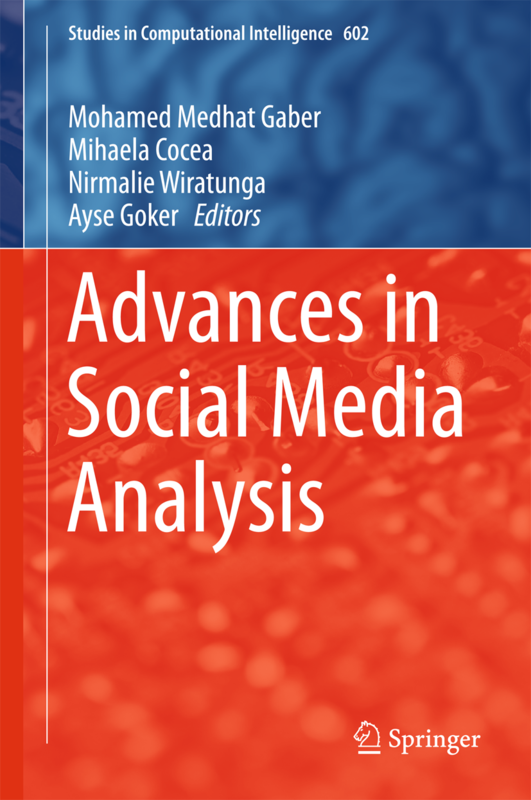 Advances in Social Media Analysis, Studies in Computational Intelligence, vol. 602, Springer, 2015. Gaber, M., Wiratunga, N., Goker, A. and Cocea, M. (eds.) Proceedings of the BCS SGAI Workshop on Social Media Analysis 2013 (BCS SGAI SMA), 2013. CEUR Workshop Proceedings, vol. 1110. Gaber, M., Cocea, M., Weibelzahl, S., Menasalvas, E. and Labbé, C. (eds.) Proceedings of the First International Workshop on Sentiment Discovery from Affective Data ( SDAD), 2012. CEUR Workshop Proceedings, vol. 917. Cocea, M. Affect in social media: the role of audience and the presence of contempt in cyberbullying. Behavioral and Brain Sciences, 40, 24-25, e233, 2017 (commentary article). Liu, H., Gegov, A. and Cocea, M. Unified Framework for Control of Machine Learning Tasks towards Effective and Efficient Processing of Big Data. In: W. Pedrycz and S. M. Chen (eds.) Data Science and Big Data: An Environment of Computational Intelligence, Studies in Big Data, vol. 24, pp. 123-140, 2017, Springer. Liu, H., Cocea, M. and Gegov A. Interpretability of Computational Models for Sentiment Analysis. In: W. Pedrycz and S. M. Chen (eds.) Sentiment Analysis and Ontology Engineering: An Environment of Computational Intelligence, Studies in Computational Intelligence, Springer, pp. 199-220, 2016. Baker, R.S.J.d., Corbett, A.T., Roll, I., Koedinger, K.R., Aleven, V., Cocea, M., Hershkovitz, A., de Carvalho, A.M.J.B., Mitrovic, A., Mathews, M. Modeling and Studying Gaming the System with Educational Data Mining. In Azevedo, R., & Aleven, V. (Eds.) International Handbook of Metacognition and Learning Technologies. Springer International Handbooks of Education, Springer, New York, pp. 97-115, 2013. Mavrikis, M., D'Mello, S., Porayska-Pomsta, K., Cocea, M, Graesser, A., Modelling Affect by Mining Students' Interactions with Learning Environments. In C. Romero, S. Ventura, S.R. Viola, M. Pechenizkiy, R.S.J.d. Baker (eds.) Handbook of Educational Data Mining, pp. 231- 144, 2010. Cocea, M., Computer self-efficacy. In Scientific Studies and Approaches in Humanistic and Economy Sciences, Ed. Lumen, Iasi, pp. 95-163, 2006. Chiroma, F., Liu, H., Cocea, M. Evaluation of Rule-Based Learning and Feature Selection Approaches for Classification. Imperial College Computing Student Workshop (ICCSW) , 2018, in press. Mohasseb, A., Bader, M., Cocea M. Analysis of the syntactical structure of web queries. The 17th International Conference on Machine Learning and Cybernetics (ICMLC) , 2018, in press. Mohasseb, A., Bader, M., Cocea M., Liu, H. Improving Imbalanced Question Classification Using Structured Smote Based Approach. The 17th International Conference on Machine Learning and Cybernetics (ICMLC) , 2018, in press. Chiroma, F., Liu, H., Cocea, M. Text Classification for Suicide Related Tweets. The 17th International Conference on Machine Learning and Cybernetics (ICMLC) , 2018, in press Chiroma, F., Liu, H., Cocea, M. Suicide Related Text Classification with Prism Algorithm. The 17th International Conference on Machine Learning and Cybernetics (ICMLC) , 2018, in press. Liu, H., Chiroma, F., Cocea, M. Identification and Classification of Misogynous Tweets Using Multi-classifier Fusion. Evaluation of Human Language Technologies for Iberian Languages: IberEval , pp. 268-273, 2018. Ibrahim, Z. M., Bader, M., Cocea, M. Mining Unit Feedback to Explore Students’ Learning Experiences. The UK Workshop on Computational Intelligence (UKCI) , pp. 339-350, 2018. Mohasseb, A., Bader-El-Den, M., Cocea, M. Detecting Question Intention Using a K-Nearest Neighbor Based Approach. In IFIP International Conference on Artificial Intelligence Applications and Innovations, pp. 101-111, 2018. Altrabsheh, N., Cocea, M., Fallahkhair, S., Dhou, K. Evaluation of the SA-E system for analysis of students' real-time feedback. The 17th IEEE International Conference on Advanced Learning Technologies (ICALT), pp. 60-61, 2017. Alkhafaji, A., Fallahkhair, S., Cocea, M., Crellin, J. Guidelines for designing a smart and ubiquitous learning environment with respect to cultural heritage. The 11th IEEE International Conference on Research Challenges in Information Science , pp. 334-339, 2017. Baker, RSJd., de Carvalho, A.M.J.B, Raspat, J., Aleven, V., Corbett, A.T., Koedinger, K.R., Cocea, M., Hershkovitz, A. Educational data mining methods for studying student behaviors minute by minute across an entire school year. In The 9th International Conference of the Learning Sciences, ICLS 2010, pp. 47 - 48, 2010. Pearce, D., Geraniou, E., Gutiérrez Santos, S., Mavrikis, M., Cocea, M., Hoyles, C., Kahn, K., Magoulas, G.D., Noss, R., Poulovassilis, A., Winters, N. An Eco-Friendly Intelligent Environment for Exploring Mathematical Generalisation. In Artificial Intelligence in Education: Building Learning Systems that Care: From Knowledge Representation to Affective Modelling, Proceedings of the 14th International Conference on Artificial Intelligence in Education (AIED 2009), p. 804. 2009 (interactive event). Cocea, M., Research methodology on consciousness. In Standards and Exigencies of Applied Psychology, Ed. Demiurg, Iasi. (in Romanian). Cocea, M. Path Analysis for Computer Self-efficacy. MSc Thesis, "Al.I.Cuza" University of Iasi, 2004. Cocea, M. Statistical approach to studying formative effects in computer science. BSc dissertation, "Al.I.Cuza" University of Iasi, 2003. Cocea, M. Computerised Version of The Battery of Tests for Education and Career Guidance. BSc dissertation, "Al.I.Cuza" University of Iasi, 2002.